I am so happy to start this thread. My first post will, however, be more a preview than work-in-progress already, hope you won´t mind. 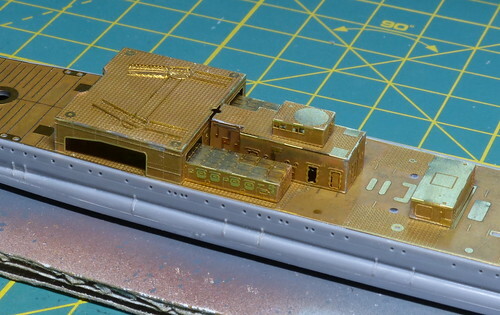 The reason is that - thanks to blacman/Greg - I became a happy owner last Friday of the main parts of a production copy of the IJN Kinugasa/Aoba Extreme Detailing Set for 1/700 Hasegawa Kit by Shelf Oddity - i.e. the 4 large PE sheets and the 3D printed parts. It has been already decribed very well by Greg himself at the link above, but there are not enough words for this really unbelievable set, so let me start with a preview of it. 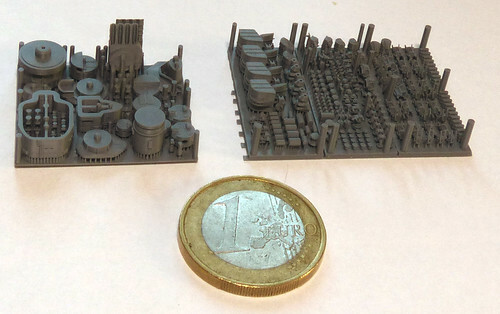 My biggest surprise (still on the Shelf Oddity stand at e-day) actually was how small the 3D printed sprues were in contrast to how large the sheets of photo-etch. 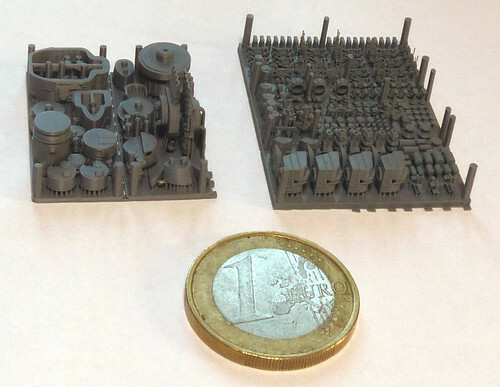 The second big amazement came when I noticed how packed all the 3D parts were on the sprues. Honestly, I have never seen anything comparable in 1/700! You can clearly see how large the PE sheets are compared to the 3D pieces. But watch out! 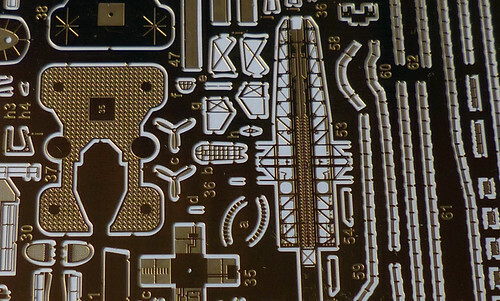 I have to admit that my camera is not the best to take the extreme detailing of these 3D parts, there are much better shots taken by Greg at the link above. Even the few shots below taken from various angles show both the detailing of the parts provided and the sheer number of those (approx. 200, hard to count them all). 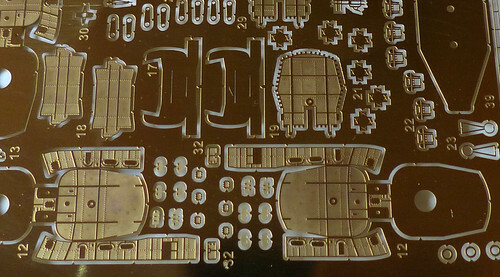 Both sprues are carefully packed in little boxes made of clear plastic for protection. 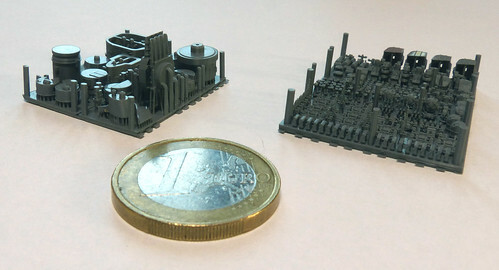 Each part is attached to the sprue by numerous tiny supports (as required by the printing technology used). These should be cut carefully from the plate at the bottom of each support. Then the remaining supports should be removed - very often just by bending them slightly (they were designed intentionally that way). Last step is smoothing the bottom plane of each part e.g using a fine sanding paper. Each PE sheet comes attached to a cardboard and all together are inserted in the usual self-sealing plastic bag. Handling the sheets deserves some caution as some parts are so delicate (like the ropes) that can be easily mangled. As Greg explained to me, distribution of the first batch to customers was waiting for the delivery of CNC tooled parts (gun barrels and masts) from Master.pl, who are the sub-supplier of these parts. So these were not included in my set which was handed over to me on the show. As I have been already using Master parts for my builds I have no doubts they will be a great component to the whole set. Distribution of the complete sets is expected to start this week. The instruction quide comes on 8 pages done in full colour plus a cover page showing details of a completed build. I found the guide both comprehensive and instructional, every detail is covered with the same care as on physical parts of the set. The contents of the guide can be seen online here. There is no easy means to check this set neither for correctness nor for fit before actually completing the build. However, as I have been watching Greg´s activities already for some time (check his awesome Kirishima sets or Furutaka build) I have no doubt about the amount of work, care and aspiration for doing it right that went into the research and design of this set. I can only repeat myself in concluding that this set is clearly among the best and most hi-tech available on the market (shortly). At the same time it is very true to being literally "extreme" as mentioned in it´s title. It is not for everyone, not for people looking for a quick build with some little extra than plain OOB. Together with the Hasegawa kit (I am not sure how many of the original parts will be used) it will probably add up to around 750 parts if the builder decides to use all of them. From a "rivet-counter´s" point of view it is a question if more could have been reallistically done at all taking into account that there are not that many detailed resources about the Aoba class´exact appearance in 1942 (slightly better for Aoba 1945 thanks to the photos after she was finally sunk off Japan). One thing is for sure though - with this set one would be able to build a super-detailed Kinugasa or Aoba without much need for anything else. I really look forward to starting my build! Note to admin: I would happily enhance this post into a fuller "in-box" (although I´ve got no box ) preview if interested. Sheld Oddity stuff is simply amazing, and I'm sure you'll do it justice! I'm simply astounded by the aftermarket that Greg is producing. I'm looking forward to your build! This is impressive. How do you feel about the surface quality on the side? There should be some layer texture, being 3D printed parts. Do you think it will be fine under some layers of paint or something has to be done to smooth it a bit? 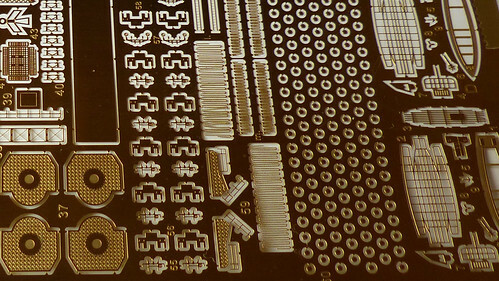 I have a number of Greg's components for the Kirishima set, and I concur that they are outstanding. Good point. This kind of texture is indeed given by the technology, still it took me some time to find some examples - and even more time to take a photo of them. This is really beyond my camera´s abilities (Lumix DMC-FZ200). The above are the only examples where I would maybe consider light touchup with sanding paper and/or a base coat. Bear in mind I really had to fiddle to make them visible and that the real size of this unwanted detail is really minimum. Quite surprisingly there are none layers at all visible on the up-standing cylindrical objects (e.g. directors) or any other vertical planes. Thanks Vladi. I'm even more impressed now. The fact that you really have to try to find it and they are located in only few, relatively easy to touch up areas, really shows the quality of the product. 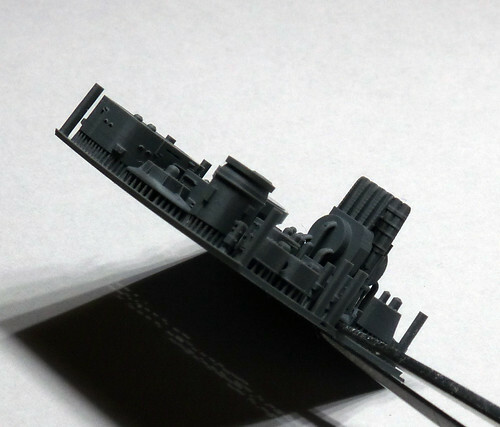 I have seen the Kinugasa model built by the designer of the Shelf Oddity parts. I am very curious how it can be built! Hello Lars, I hope to be able to start the build soon! I´ve been recently very busy at work but finally I got to some building on the Kinugasa. First of all I assembled the hull sides and waterline plate so that I could prepare the seabase – that is my usual start of the build. 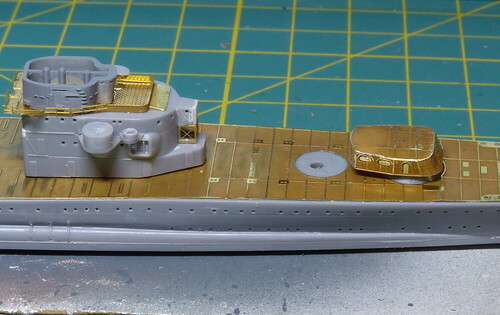 I removed some of the mold-on details like aft anchors, ladders and even the upmost part of the bow carrying the imperial chysantemum as there are PE replacements available for them in the set. I drilled the portholes, too. I admit I have not used a PE replacement for an entire deck before but I thought attaching it properly in one go may be a challenge, so I decided I will drill numerous holes through the deck that would allow applying CA glue to certain spots from the bottom. This meant that either the deck itself or the waterline plate had to be attached to the hull after the replacement deck was in place. I decided to attach the waterline plate first because I consider it more critical to avoid excessive sanding and damaging hull detail, especially the large amount of pipes on hull sides. As the replacement deck is slightly larger than its styrene counterpart I hope gluing the deck later would not turn into a nightmare. Then came the most destructive part of the build. 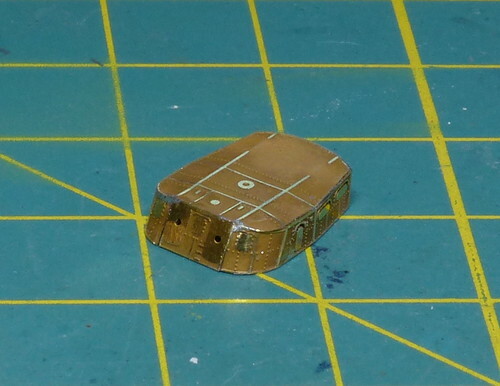 I removed everything from the deck, every little detail the Hasegawa engineers designed there is gone, just the plain styrene deck remains with the only the bases for #1 and #3 turrets preserved. Now it comes to the PE deck. 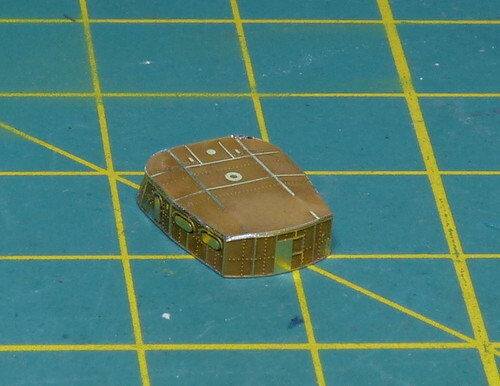 The brass is nicely thin and cuts from the sprue easily with a sharp Exacto knife. When I dry-fitted in over the styrene part I realized that it perfectly fits its shape and is overall slightly larger, that will help to cover any gaps (in fact there are some only on the bow and stern). The only problematic area seems to be the stern, where the curve of the hull does not correspond properly to the shape of the deck (both styrene and PE, see photos) – the hull is somewhat „boxier“ and less smoothly curved than the deck. Also the thickness of the hull remaining off the PE is larger there than anywehere else. To compensate for this I decided to sand off the stern a bit to make it correspond to the deck. I think it looks much better now. Having hopefully sorted out issues that have been keeping me busy and off my builds for some time, so I´ve resumed my work here. I decided to start with the main bridge as I was eager to try the PE and 3D printed parts. Nothing much to show so far but I though my first experiences with building with the Extreme Upgrade set might be of interest. I worked with 3D printed parts in the past already – the semi-trasparent FXD from Shapeways and orange/brown from 3Dmodelparts - but this is my first experience with „grey resin“. Parts have numerous supports from the wafer to the bottom and they are very close to other parts, so I first separated the wafer from other parts and than cut through supports near the wafer by a saw made from a razor blade. The remaining support stumps are designed to separate easily from the part´s bottom if bent slightly using pincers. Several runs over a 400 sanding paper laid flat on a working mat and the part is ready for use – much easier than working with resin models! Just be careful, the material is much more brittle than ordinary resin. It also happens that some of the neighboring small parts separate by accident when working on the wafer so one should be careful not to lose any. I will post some photos later when I have something to show. 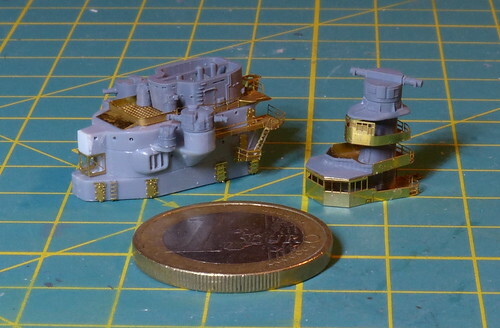 I promised some photos, so here they come (everything on the main deck is dry fit). 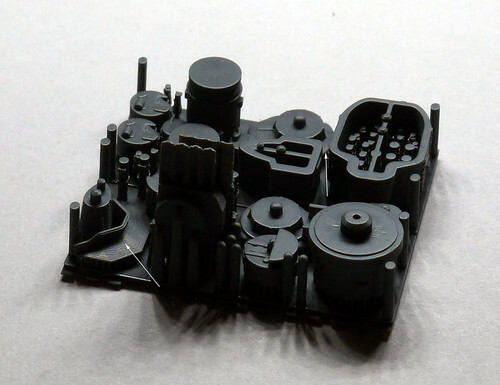 I worked on the large PE parts in order to familiarize myself with the thin material before trying the most intricate parts - main 8in turrets. I prefer soldering over CA for the larger parts, so I tried it on the first one, too. It will need some more cleanup, but the shape is there without much hassle - big to blacman for the design! Overall, the fit of the set has been perfect so far. So what CA glue do you use to put it all together? Im always searching for the best CA with toughest hold, a bit of flex in first 30sec to reposition, and one that is easy to apply (applicators). Thanks for your support, Martin and Chris ! CA: good question, I´m still struggling. Actually, right now I use the cheapest stuff available here for something like $0.50 (regular or gel, 3g package) and it works quite ok for me. The main reason is that whenever I tried anything expectedly better, the more I paid for it the earlier the cap got stuck to the nozzle or the nozzle got stuck inside and I had to make pinholes to get at least some of the glue out. Surprisingly, this cheap stuff lasts the longest and it´s no pain to throw it away when it´s finally gone. 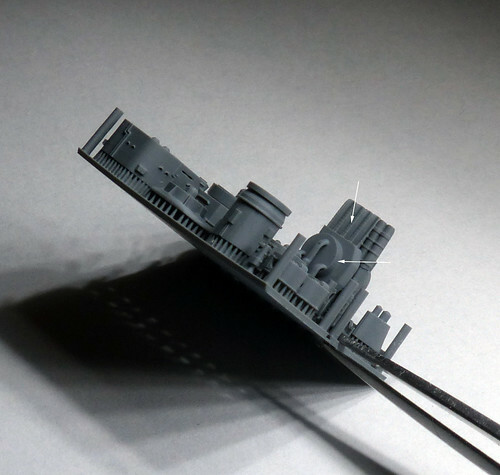 I apply it using a steel pin or wooden toothpick, or a thin wire (0.2mm) where I need only a very small amount. Not exactly happy about the situation but the best what I´ve tried so far. Plus soldering for joints where I want durability (superstructure, masts etc.). He has just got an e-mail from me about Kinugasa. Dear Mucho, thanks a lot for getting in touch! 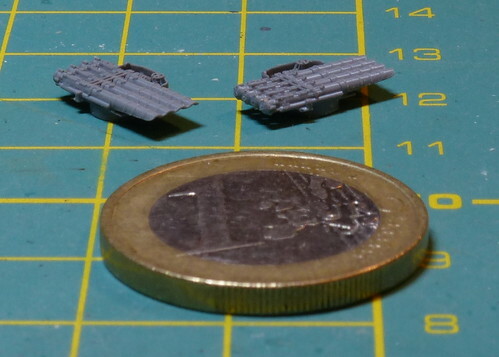 While cleaning the 3D printed parts I´ve been stunned once again by the incredible level of detail, especially on the torpedo tubes. Note the wheel!